These blue feathered birdies have deep blue coloring on the top of their heads, wings, and tail with bold rufous coloring on their breast. Females have slightly less coloring than males, and have a white ring around the eyes. Habitat: They can most commonly be found in open, coniferous fields and steppe habitats. In the winter they expand their terrain to a variety of semi-open areas including farmlands. 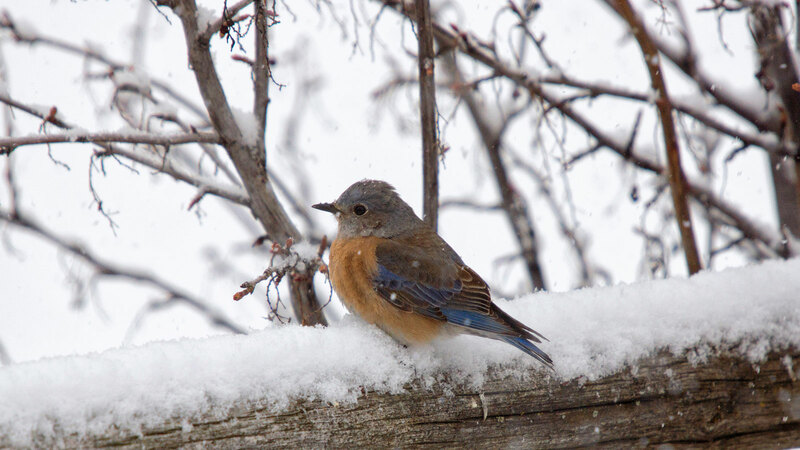 Diet: During the warmer months the Western Bluebird primarily consumes insects. During the winter, berries and small fruit are incorporated into their diet. Nesting & Breeding: Bluebirds are cavity nesters. They are often spotted nesting in old woodpecker holes and man-made nest boxes. Females build the nest, sometimes with the help of the male. The nest consists of a loose lining of twigs, leaves and other plant material. Males arrive at the breeding grounds before the females, and defend the nesting territory by singing. The female then incubates her eggs (generally 4-6) while the male provides her meals. Once the eggs have hatched, the mother will stay with the young while the male continues to bring food. The young fledge the nest around 2 to 3 weeks of age. When the word "wildlife" comes to mind, we often think of an eagle or a pack of wild elk, and other animals that roam in remote areas of the county. But here in Okanogan Country we have wildlife all around us. You don't have to challenge yourself with a 10 mile trek into the wilderness in order to spot these animals. In fact, a lot of these creatures are living right outside of your doorway. According to WDFW, a typical neighborhood in Washington has more than 25 species of birds and mammals. Meaning your backyard might just be home for one of these Western Bluebirds! Are you interested in ADVENTURE!? Learn more about all of the amazing outdoor opportunities within Okanogan Country.